On September 14, 1975, Pope Paul VI enrolled Mother Seton in the Church's official list of saints. She is commemorated on January 4, the day of her death, considered by the Church her heavenly birthday. Because that day falls this year on a Sunday, American Catholics will not hear about her until 2010. All the more reason to thank God for the spiritual courage and strength of this woman, the first native-born American to be canonized, and to invoke her prayers. On December 18, 1959, Elizabeth was declared Venerable by the Sacred Congregation of Rites of the Catholic Church. She was beatified by Pope John XXIII on March 17, 1963, and canonized by Pope Paul VI on September 14, 1975, making her the first native-born United States citizen to be canonized. Her feast day is January 4. St. Elizabeth Ann Seton is popularly considered a patron saint of Catholic schools. Her name appears on the front two doors of St. Patrick's Cathedral, as a "Daughter of New York". The National Shrine of St. Elizabeth Ann Seton in Emmitsburg, Maryland, is open to the public. 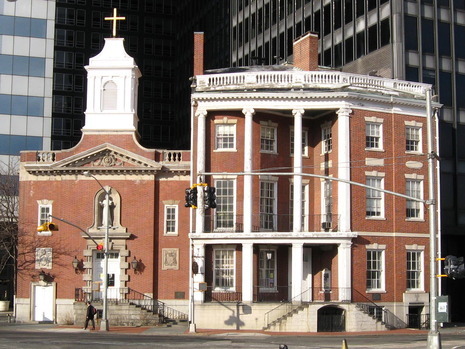 In addition, In New York City, the Shrine of St. Elizabeth Ann Seton was built on the site of her home in Manhattan, and is accessible to the public. She had many schools named after her. Blessed John XXIII declared Elizabeth venerable December 18, 1959, and also beatified her March 17, 1963. Pope Paul VI canonized Saint Elizabeth Ann Seton September 14 during the Holy Year of 1975 and the International Year of the Woman. The Holy See accepted three miracles through her intercession. These included the cures of Sister Gertrude Korzendorfer, D.C., (1872-1942), of Saint Louis, of cancer; a young child, Ann Theresa O’Neill, (b.1948), of Baltimore, from acute, lymphatic leukemia; and the miraculous recovery of Carl Kalin, (1902-1976), of New York, from a rare form of encephalitis.